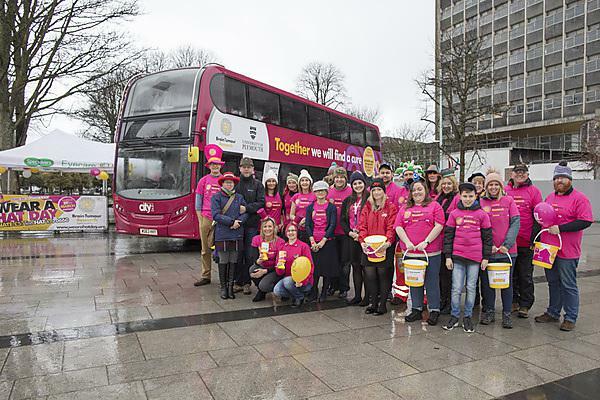 Plymouth Citybus has launched a special vehicle in partnership with national charity Brain Tumour Research and the University of Plymouth. 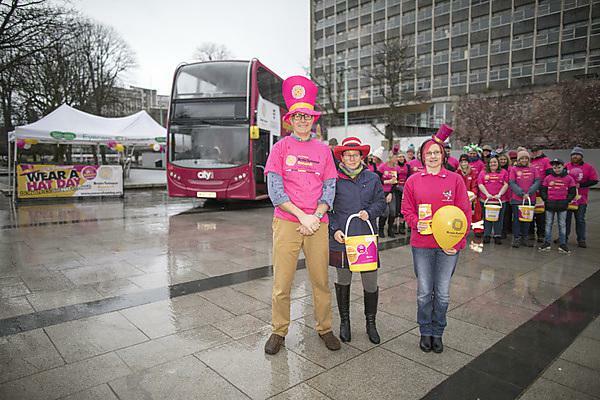 The bus was launched on Wear A Hat Day (Thursday 29 March) – the annual fundraiser for Brain Tumour Research – and will be used to raise awareness of the funding needed to continue research into a disease that affects thousands of families each year. It will also be used as a promotional vehicle at key fundraising events throughout the year, including the Britain's Ocean City 10k and Half Marathon races. The University of Plymouth is home to one of four Centres of Excellence set up by Brain Tumour Research, where scientists are focused on improving outcomes for patients and, ultimately, finding a cure. Professor Oliver Hanemann is the lead researcher at Brain Tumour Research’s Centre of Excellence in Plymouth, and Director of the University’s Institute of Translational and Stratified Medicine (ITSMED). The team in the Centre of Excellence is focussed on how low-grade brain tumours develop. These tumours are usually slow-growing but can become malignant. Our team are leaders in the investigation of low-grade brain tumours, which are usually slow-growing and frequently affect children and young adults. Such tumours can be just as devastating as malignant tumours and can bring equally dangerous and debilitating effects to patients by causing neurological conditions including loss of balance, weakness, cognitive problems, poor hearing, epilepsy and personality changes. Brain tumours are indiscriminate; they can affect anyone, at any age. What’s more, they kill more children and adults under the age of 40 than any other cancer, yet just one per cent of the national spend on cancer research has been allocated to this devastating disease. “To have a cutting-edge research facility on our doorstep is great for Plymouth and shows that the city is leading the way in research into brain tumours. We're proud to be supporting such a worthwhile cause and hope the striking new bus really helps to raise awareness of a disease that affects so many people each year. Passengers travelling on the bus will be able to donate on board as well as find out more about where the money raised will go." A number of patients and families who have been affected by brain tumours joined the event to show their support. Heather Turner, 46, from Brixham, was diagnosed when she was 24 with a low-grade brain tumour. For Heather the only treatment option was surgery, but complications caused nerve damage leading to life-long difficulties including facial palsy and the loss of sight in one eye. Joining them were nurses from the neuro-oncology team at Derriford Hospital in Plymouth have been supporting the event by donning decorative headwear and encouraging their colleagues to join in the fun. Every year patients of all ages, with many different types of low- and high-grade brain tumours, are treated by the expert team at Derriford. Wear A Hat Day event has raised over a million pounds since it was launched by Brain Tumour Research nine years ago. The money raised funds research that is taking place at the charity’s four Centres of Excellence, including the one at the University of Plymouth. In the UK, 16,000 people each year are diagnosed with a brain tumour. Around 16,000 people a year in the UK are diagnosed with a brain tumour. We're working with Brain Tumour Research to improve research and treatment. Brain Tumour Research is an official charity partner of the University and we are one of four universities in the UK working with the charity to improve the treatment and outcomes of brain tumours. Plymouth’s Centre of Excellence specialises in low-grade brain tumours, which are usually benign, slow-growing but ultimately can become malignant. Our focus is to identify and understand the mechanism underlying the development of brain tumours, and explore ways to halt or reverse that mechanism.